There were two schemes for scrubbing #CO2 out of the atmosphere and turning it into fuel. In July 2008 it was NaOH scrubbers and exotic catalysts; in March 2012, it was ionic amine fluids and a formic-acid fuel cell. Both were tricky to describe, energy intense, and costly; years later, neither is yet ready for prime time. Then this June, tales of a refreshingly simple new direct air capture (DAC) CO2-to-fuel scheme that’s already running in a pilot plant. 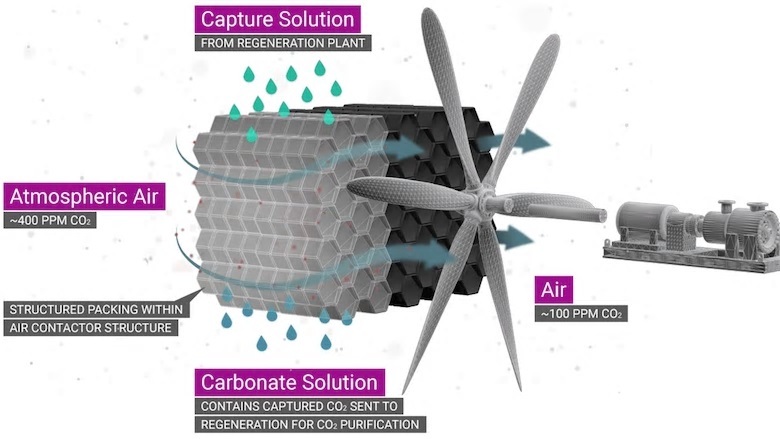 #Canadian energy company #Carbon Engineering—founded by #Harvard professor David Keith with venture capital funding from #BillGates—has been scrubbing CO2 for three years now in Squamish, #British #Columbia, for conversion to liquid fuels. An obvious secret to CE’s success is its reliance on existing industrial technology. The scrubbing operation is essentially a power-station cooling tower grafted onto a pulp/paper mill, augmented with tweaks from the water-treatment and gold-extraction industries. The fuel conversion involves universally understood Fischer-Tropsch gas-to-liquid tech.